Trentanove is a warm, welcoming restaurant offering Italian cuisine and drinks in a location close to the Kamo River. But they’re the most famous for their world-renowned latte art. Their award-winning baristas make beautiful, life-like latte art appear into the crema of their coffee. They also have a varied food menu, of which their dinner set gathers the most praise from their customers. Having a nice appetizer, and then a main with a glass of red here is one of the best ways of spending a night in Kyoto that I can think of. And can also get their lattes to go, so you can also drink it by the Kamo River. The main attraction at this restaurant is, of course, their café latte. The milk foam is poured into the espresso with such precision that in a moment you have a beautiful swan in front of your eyes! The cafe latte gets its sweetness from the milk used to make it, and the coffee is made from dark roasted beans, so it’s not at all bitter and very easy to drink. A great job by the baristas! The dinner set starts with appetizers, baked pumpkin, bream carpaccio, prosciutto, figs, tomato and other vegetables. The main, the steak, just melts in your mouth; as expected, as it’s a very nice flat iron steak. The sauce you get with it enhances the flavor of the medium-rare steak. You also get fresh salad and bread to go with the steak, so this dinner set is sure to leave you feeling satisfied. The red we had with it was a great all-natural wine which went incredibly with the medium steak. Trentanove has a good selection of white and red wines, and the day we went to the restaurant the day’s white was from Italy. The taste was a little bit sour, and it went together well with the appetizers. They also have wines that are not on the menu so be sure to ask the staff. 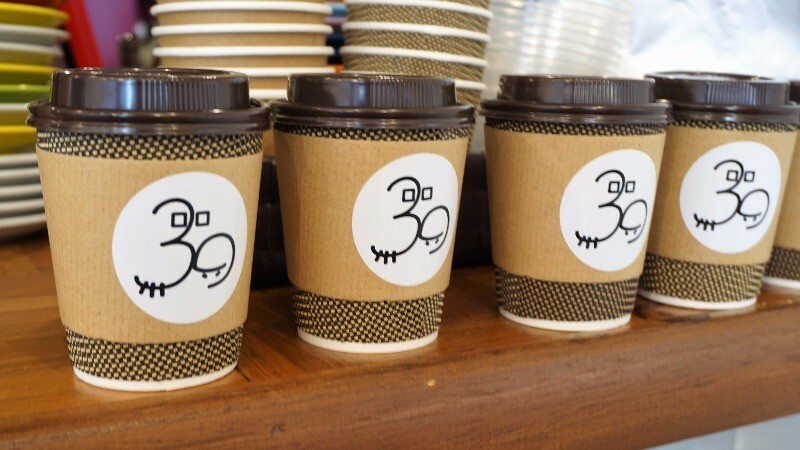 You can also get a cup of café latte to go! This is a great chance to have a mini-picnic by the Kamo River. The Italian cuisine here is delicious, but be sure to also try their café latte. I was surprised by how beautiful the latte art was! It felt like I had seen the hand of God at work when the beautiful latte art just appeared on top of the latte. Their steaks were soft and juicy, and the appetizers refreshing. When you add a glass of red wine, the dinner was perfect. I like restaurants that have a rustic feel to them so I’m definitely going to Trentanove again! The café latte was easy to drink, even for me, a person who normally doesn’t drink coffee. You get to watch closely as they make the latte art, and the moment you get to see the art appear on top of your cup of latte is magical. So after eating here, be sure to order a latte too! A 1-minute walk from Kojinguchi bus stop or a 7-minute walk from Keihan Jingu-Marutamachi Station. You can get here by bus or Keihan, and the staff is friendly, so how about having some delicious food here? Nonsmoking (There is a smoking area outside).